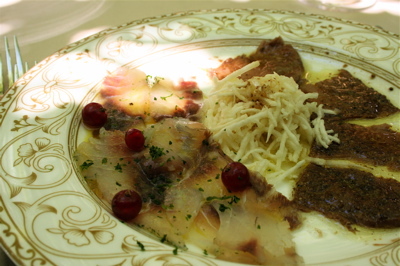 First, there was sea bream carpaccio with a slightly sweet tang from berries and celeriac slaw (photo above). The fish was melt-in-your-mouth fresh and clean. Jon and I debated whether the tuna carpaccio had been slightly seared before being marinated in a balsamic vinegar. I think it’s likely the tuna “cooked” in the vinegar, ceviche style, but regardless of how it was prepared, it was meaty and again sweet and tangy from the vinegar. A refreshing dish. 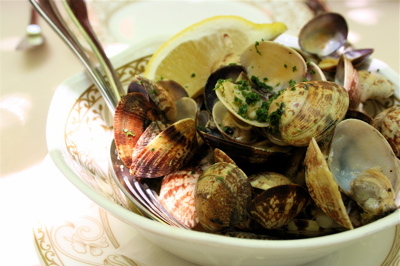 The vongole in white wine sauce (photo above) was *so* seaside in a bowl. So often, clams might look big and plump but they turn out tasting like masses of rubbery nothing. But at Corte Sconta, ours were big *and* juicy. Heaven must be an endless bowl of these things. And then, to complete the appetizer course, we were served spider crab in the shell; salted cod on polenta cakes, small shrimp, scampi, and grilled octopus. It was all fresh, simply-prepared and tasty, but the standouts were definitely the spider crab and the salted cod on polenta cakes. I’m not a fan of salted cod, as some of you may know (I could never live in Spain for fear of the ubiquitous bacalao), but Corte Sconta’s version is whipped up creamy and light, and then all that saltiness perfectly balances the creamy blandness of the polenta. We were stuffed after all those appetizers, but being champion American overeaters, we managed to still enjoy our lobster tagliolini (photo above), which combined the best of Italy, generally (al dente fresh pasta) and the best of Venice (seafood). 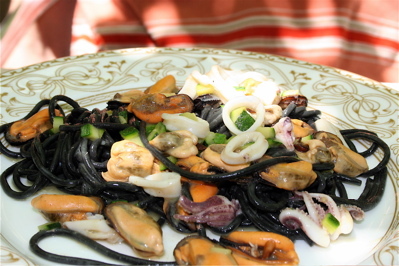 Squid ink spaghetti (photo above) was worth the 16 euros just for the riot of seafood it came with. Sure, everyone around us seemed to be toting guidebooks (I’m guessing Corte Sconta makes an appearance in every Venice guidebook), but you really can’t escape tourists when eating out in Venice. 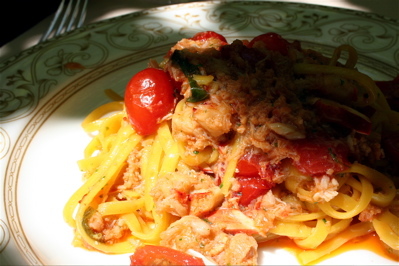 That said, Corte Sconta was head and shoulders above a lot of other Venetian meals I can remember. It’s pricey (115 euros for the two of us, including a bottle of wine and the irritating coperto), but you get a lot of food prepared with fresh ingredients and care, all served in a pretty, out-of-the-way-feeling dining space. Corte Sconta, Calle del Pestrin, 3886; +39 041 522 7024; Closest vaporetto stop is Arsenale, but because everything’s walkable in Venice, I’d say it’s a 15-minute walk, max, from St. Mark’s square. 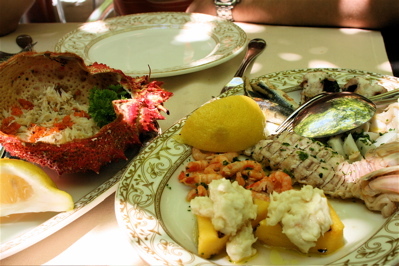 If you enjoyed this post, you might also enjoy reading my impressions of two other restaurants in Venice, Vecio Fritolin and Osteria di Santa Marina. 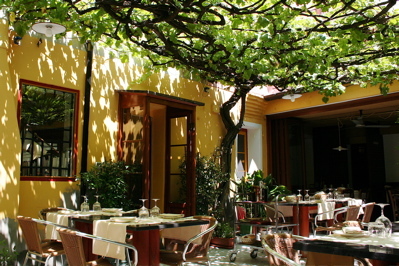 So great that you loved your visit to Corte Sconta. So sad to hear that it is being over-run with tourists. When I first went there, years ago, the crowd was easily 90% locals. I guess you can’t keep a great place a secret for long. Chubby Hubby – I’m definitely with you that even as a tourist, you don’t want other tourists to be dining where you’re dining. : ) But in Venice, I just sort of let go of that hope because according to articles like this one in the Guardian in 2006, Venice’s population is 62,000 and yet it sees 50,000 tourists *a day*. To me, this stat means it’s pretty inevitable that all restaurants in Venice, both good and bad, will cater to their share of tourists. So I can still hope for good food, but I probably shouldn’t hope to avoid tourists. Wow! It sounds like it was worth every penny though. I’m afraid to say I didn’t like Venice when I went there in December. It was so overrun with tourists that it felt suffocating. We couldn’t wait to return to Bologna, where we were staying! But it’s nice to hear that if I ever go back, I’ll have a lovely place to eat at. Have you read The Glassblower of Murano? If you like Venice, you might like it. I read your July 4th entry, ‘An American in London’ from 2007 and thought I would tell you that my new book, ‘Don’t Tread on Me — anti-Americanism Abroad’ is now out on Amazon pre-order and will be in the shops in October 2008. You might enjoy it. Foodieguide: I’ve been to Venice in May, June and July, and the city was definitely packed with tourists each of those times, but for me, once I leave “big” spots like St. Mark’s Square or the Rialto bridge, I think it’s still possible to have empty walkways to yourself. Also, while intellectually I may want to dismiss Venice as “for the tourists,” I think it’s just such a beautiful city that it’s understandable why it’s so popular with visitors. Carol: Thanks for the July 4th wishes and sharing news of your book. Maybe I’ll give Venice another chance next time I’m in Italy. I’ll try the winter! Assuming you are still in London I should like to persuade you to visit our tiny 5 table restaurant in Norfolk that is the current holder of the Good Food Guide’s Best Fish Restaurant in Britain award. On Thursday we are in Venice and booked into Corte Sconta expecting it to be everything you and many reviewers claim it is. I’ll be accompanied by Tina who is both my chef and wife and is recognised by the industry as arguably the best fusion fish and seafood chef in the UK. Please take a look at our website (www.broveylair.com) where you will find a selection of menus to illustrate the kind of exquisite 4 course dinner for which we have become known amongst our loyal following of foodies and fish lovers. We have contemporary overnight junior garden suites and offer a tropical Cal/Mex breakfast. All diners get to discuss a menu with Tina prior to their visit so we shall look forward to your call.